Entering the more advanced world of studio gear and in particular speakers, studio monitors come in a few different ‘types’, for lack of a better term. 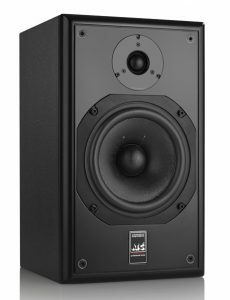 Passive studio monitors are very popular in the mixing and mastering department of the music studio gear world, however we know many who also prefer this type compared to active and powered monitors when producing or even listening to music leisurely as well. 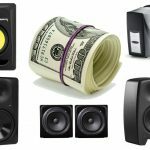 Of course it all comes down to personal preference — many will recommend to ‘stay safe’ with active monitors, where as somebody like us advise that if you’re able to learn about some of the intricacies that go into setting up and working passive monitors properly, it can go a long way with the overall sound and quality of your mixes. 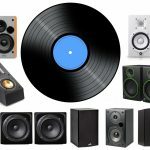 What are passive studio monitor speakers? Better known as “unpowered” monitors, a passive studio monitor speaker is slightly different from the traditional pair of speakers you’ll see in a studio as they need an external powering device. 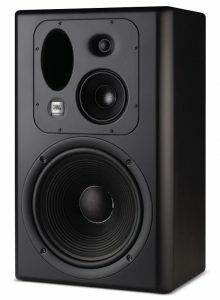 Whereas “normal” studio monitor speakers have power sources built-in to the speakers themselves (‘active’ monitors have a separate amp for each driver, whereas ‘powered’ monitors differ since they have only a single amplifier to feed both drivers with a crossover), passive monitors need an external source to power them up. So why would anybody want this? 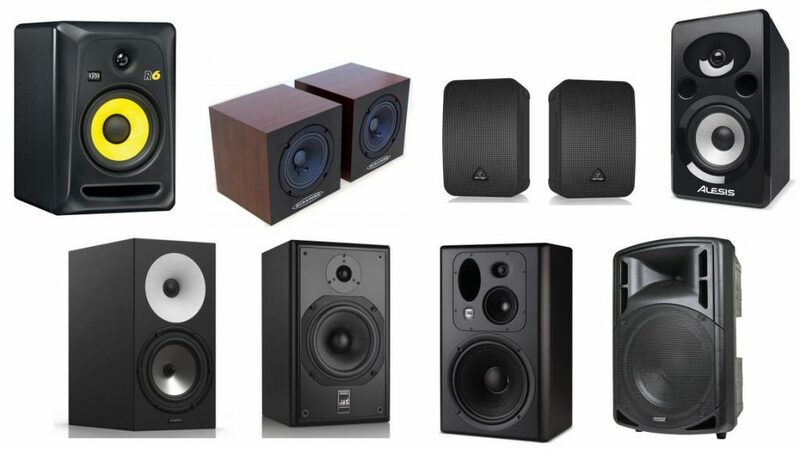 As you can imagine, there are quite a few pros and cons to both ‘types’ of studio monitor speakers. For those in the active monitor department, there’s no need to worry about finding an external power amp, mixing and matching components and making sure they’re compatible. You also don’t have to worry about circuitry protection and line-level crossovers. However on the other hand, you definitely don’t get as much flexibility and many times, overall power. 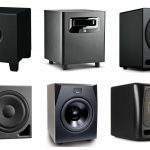 Some lower-end active monitors also sacrifice some key components of a speaker to save some money, such as poor-quality built-in power amps, power supplies and more. 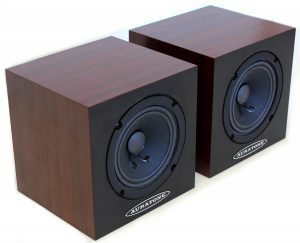 If you’re able to add passive monitors to your studio repertoire, you’ll be gaining quite a lot. If you do indeed need to learn about how to set them up, find a proper power amp and crossover and ensure the circuitry is protected well, we recommend you take the time to do so since passive monitors take your mixing, mastering and overall music production studios into the next level (although it still ultimately comes down to personal preference). You have more flexibility when it comes to sound and in particular the amp, since you have the freedom to buy a high-end amp whereas with active you are stuck with what’s inside. There are many benefits to a better and more advanced power amp, such as adjusting wattage, hiss noise, bass response, EQ, and ultimately, the overall ‘feel’ of the sound. You can also upgrade your amp later down the road if you were to ever need to, or perhaps keep your amp setup and upgrade the speaker themselves (they aren’t cheap!). You can also replace the amps once they die, since they typically have less of a lifespan than speakers themselves. Although starting off our list with a model for those in the higher budget-range, the Amphion One18 is a perfect combination of performance and sustainability, and very widely known around the market for its overall quality. This passive studio monitor speaker is a genuine overall as it provides a Corian waveguide for optimal control and better performance. This is going to expand on your speaker’s tweeter’s ability to combine with the air, and extending down to the 1.6kHz crossover point making the spreading of the overall system seem more constant throughout a wide frequency range. In addition, this speaker has a 2-way passive construction with a rear-mounted passive radiator for additional back-end support. The monitors passive design helps keep sensitive electronics away from magnetized moving drivers which is inevitably going to make your monitor a whole lot better. The One18 is also equipped with point source performance for an enhanced driver integration, which is always going to be difficult to perfect when it comes to your speaker’s design and construction especially in the active competitor department. 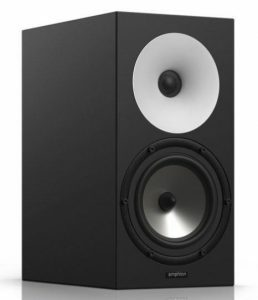 Simply put, the Amphion One18 is one of the best passive studio monitor speakers and if you grab two of these, you won’t be lacking quality whatsoever. Up next is another high-end pick for the best passive studio monitors, this time however slightly cheaper than our previous pick since it’s sold in a pair. The 6″, 2-way passive monitors are known widely by users for their overall quality, in particular warm low-end and mid-range due to the constrained layer damping (CLD) driver. The overall build however is what sets these a part from many, since their internal parts are rather intricate — hand-wound voice coils made from flat, oxygen free copper wire (aids in a long magnetic gap for operation), magnet vents for airflow and reduction of noise and heat, all to which combine for great power handling and overall longevity. 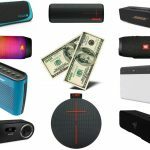 Some of the standout specs include, but aren’t limited to, a 6″ woofer and 1″ tweeter, 2.2 kHz crossover frequency, 80 to 16 kHz frequency range, and cut off range of 56 Hz to 22 kHz. The ATC SCM12 Pro are high-end to say the least. When it comes to passive monitor stereo systems, the KRK R6G3 is one of the best in the business. Although this is a passive speaker system, its sound is as daring as ever, as it comes equipped with a glass aramid composite cone woofer, as well as a front-firing port that offers low-frequency extensions while avoiding boundary coupling. The R6G3 also has a high frequency Waveguide that comes out crisp and clear for a highly detailed sound while alleviating distortion. In general, traditional speakers tend to have disfraction as sound leaves the edge of the cabinet and reflected back into the sound which causes phase distortion. This monitor speaker however pretty much removes diffraction in addition to providing high-quality sound due to its optimally designed curved surfaces. 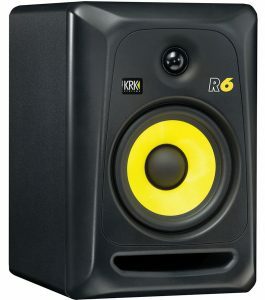 The KRK R6G3 are one of the best passive monitor speakers on the planet and come with a 49 Hz – 20 kHz, +/-2 dB frequency response for a solid range in our studios. Very affordable as compared to others, in particular for home studios here. Don’t allow the shape to fool you as it had for us. The 5C are rated highly by many, not only because of their retro look that resemble what the norm was back in the 70’s and 80’s. We have a nice laminate finish on top of the 4.5″ enclosed speakers, with a response of 75 to 15 kHz and SPL up to 90 dB. The response is known to be very flat with a great amount of power handling, and since they’re portable may peak your interest if you intend on traveling to other’s studios in your spare time. 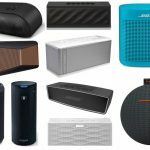 The Auratone 5C Super Sound Cubes are definitely ‘different’ when it comes to the best passive studio monitors in this list, but not worthy of at least you taking them into consideration, especially since many user reviews praise these for their very clear sound, ease of set up, and ultimately an overall aid in the clarity of your mixes to pick up those little nuances your usual active speakers sometimes fail to catch. The JBL LSR series is one of our favorites and that claim is definitely backed up by a lot of musicians of all types in the world since their release. This particular model here is their passive version, and the LSR6332 is known for it’s 12″ woofer (differential drive dual coil), 5″ mid-range (kevlar) and 1″ tweeter (titanium composite). Something called ‘advanced linear spatial reference’ design helps in the flatness of the response with these, coupled with just simply higher-end internal organs justifies the price-range of this one. They’re so advanced you’ll have to buy two separately since they come in both left and right side versions. A few other highlights here include linear dynamics aperture port design (helps with port compression and turbulence), as well as magnetic shields for further protection. Combined for two it’ll get up to a few thousand, but if your budget is high, the JBL LSR6332 is by far the best passive studio monitor speaker in the market for those with the cash to drop. The Alesis Elevate 6 Passive monitor speaker is the lowest we’ll go in terms of price for this guide. It is a 100 Watts RMS, flat frequency response that enables more accurate monitory and mixing for listeners. This passive monitor is engineered for smaller home studios and especially those just beginning to get their feet wet in the passive studio monitor game. It leverages its enhanced baffle radiuses for reduced edge diffraction, and snowballs of its premium audio components for the optimal response that meets modern-day listeners demands. The design of this speaker system is a nice high-density wood cabinet that comes equipped with dual pass porting so that you can record, mix, and listen whenever you desire. 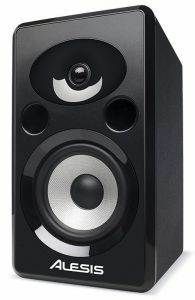 This is one of the best passive studio monitor speakers for various audiences, and can be played seamlessly in just about any setting you can think of. Alesis’s Elevate 6 passive studio monitor speaker is offered with an onboard HF trim switch so that you can feel like a pro, and have a top of the line monitor setup for your studio without breaking the bank. 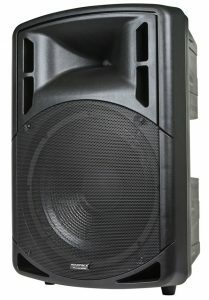 The Monoprice Stage Right is a unique passive monitor PA system that can amplify flat frequencies and extend lower without ear fatiguing distortion. 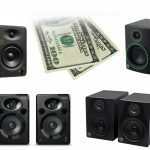 This speaker system is great for your stage setup in the middle-end and is one of the best passive studio monitor systems available for purchase in this category. Definitely different from the rest of our list in terms of settings, it is equipped with a bi-amped power, you can deliver your sound with 80 watts to woofer and 40 watts to the tweeter. This is essentially going to reduce the chance of power loss integral with passive crossovers, and will certainly reduce your inter-modulated distortion when you’re on stage. Here we have a passive speaker that is not only genuine, but also comes with Kevlar bass drivers to allow reference monitors to hit the way they were designed to. In addition to its expertly crafted design, and advanced monitor technology, the Monoprice Stage Right is going to come to you with a 1.25” silk dome tweeter along with a 4-position room compensating switch to keep your mid and high frequencies impartial yet effective. 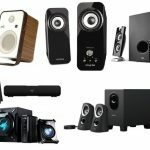 Explained: What are the Different Types of Speakers? 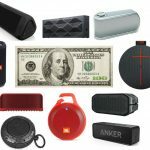 My Speaker Guide is a participant in the Amazon Services LLC Associates Program, an affiliate advertising program designed to provide a means for sites to earn advertising fees by advertising and linking to Amazon.com.